Understanding the pre-disaster lives of the people, illuminating the problem that they have faced for years, and examining its relationship with the disaster are indispensable when we envision reconstruction and restoration of the devastated socio-economic geography in the Sanriku coastal areas among many parts hardly hit by the 2011 East Japan Earthquake. This is evident if the survivors are to be readapted to both well-known and changing geographical settings of their ancestral land. One of the serious problems after the tsunami hit is a severe pressure on the regional system of medical services. Many hospitals and clinics near the seashore were destroyed, and the hierarchical system of primary medical care in the immediate vicinity of the impacted localities up to secondary care for serious cases in the regional center has stopped functioning, as many patients at refugee sites with worsening sanitary conditions and mounted need for primary and even secondary care proceed to a small number of regional hospitals. The regional medical care system with intensification of specialized staff at regional hospitals has been introduced in Japan since the beginning of this century partly as a response to rural depopulation, ageing, and shortage of medical staff. This has caused anxiety about spatial differentiation and inequality in medical service provision. 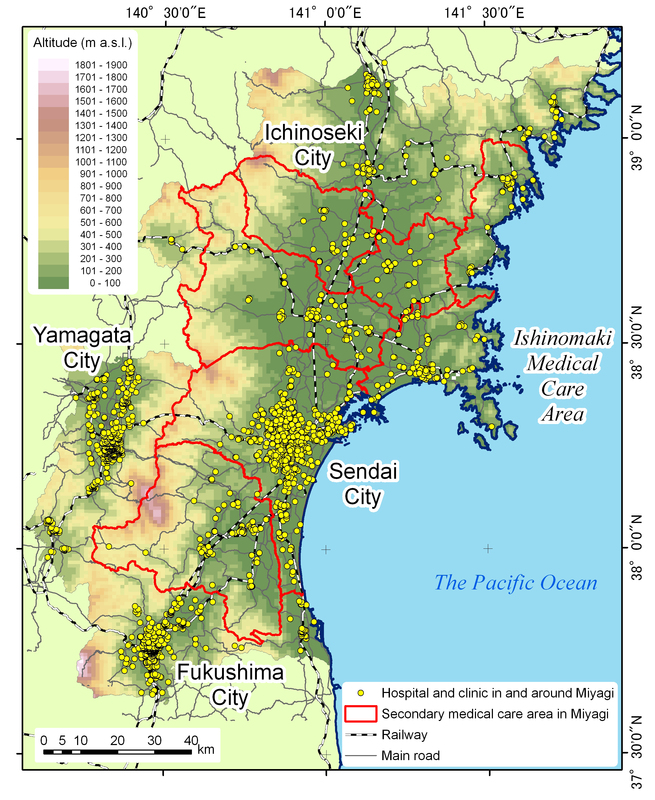 In the southern Sanriku coastal areas in Miyagi Prefecture, including Ishinomaki Medical Care Area, services are distributed disproportionately to its large geographical extent of the area, not to its small population (Figure 1). Once the small number of hospitals and clinics in each locality are damaged, the idea of hierarchical treatment does not work. Moreover, shortage of fuel for car mobility has left many potential patients away from care. It became indispensable for the surviving medical staff, with additional assistance from other parts of the country and even from abroad, to make a great and difficult effort to monitor and search for more serious patients at refugee sites. Medical institutions located outside of the affected areas have supported in secondary care, for instance those in Yamagata Prefecture※1. This port was also severely hit by tsunami. The hierarchical idea was not fully realized even before the disaster in geographical terms at least: more direct trip to the regional center for primary medical treatment was normal※2. 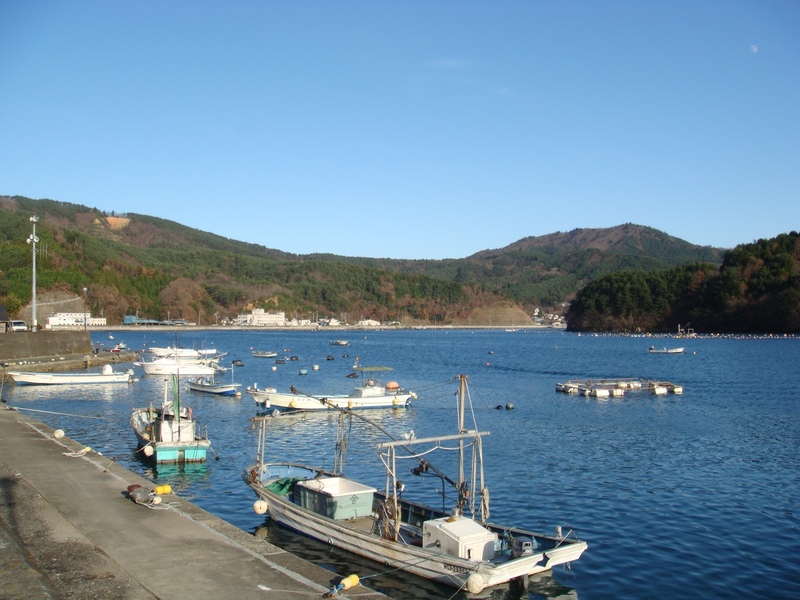 The population in seaside Ogatsu area (population in February 2011: 4,300, Photo 1), a part of the enlarged Ishinomaki City (162,822), have endured a small number of hospitals and clinics locally available for primary and secondary care (Figure 1). As its high proportion of ageing population suggests (those 65 years old and over: above 36%), accessibility to hospitals and clinics having staff for obstetrics, gynecology and pediatrics is relatively lower for the Ogatsu residents in comparison to other areas in Miyagi Prefecture (Figure 2A, B). The accessibility is measured in terms of a time-distance network of roads with at least three meter wide in 2008, assuming use of private cars. Actual selection of and trip to obstetrics and gynecology services among the parents whose children attended the Ogatsu Primary School in 2008 (89 questionnaires administered, with a response rate of 66%) was inevitably destined for Ishinomaki city center since that is the nearest place with these services (Figure 3A). 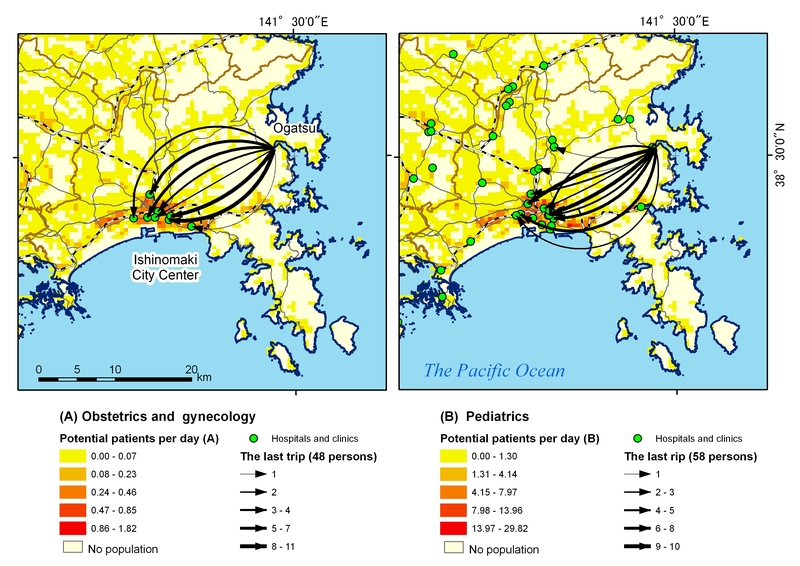 A separate calculation shows that over 80% of the potential patients in the southern Sanriku coastal areas lived more than 30 minute-drive away from medical facilities specializing in these services. Meanwhile, the service distribution of pediatrics is less uneven, and many areas in Miyagi enjoy shorter trip time: this is also applicable to Ogatsu (Figure 2B). The case of Ogatsu parents, however, indicates their everyday dependence on the distant Ishinomaki city center even though they have a few choices within 10 minute-ride for their children needing primary care: they drive for more than 30 minutes to enjoy more various selection available in the center (Figure 3B). What has been on the ground since before the tsunami strike is different from the hierarchical medical care in these specialties that are supposed to counter fertility decline, but more direct reliance on the regional center (but not necessarily on regional hospitals) with the help of car ownership and road network. Assuming a large proportion of refugees would like to come back to their town and familiar land, with their dense social network, restoration and/or restructuring of the medical care system should consider the pre-disaster conditions and changing age composition of the population. 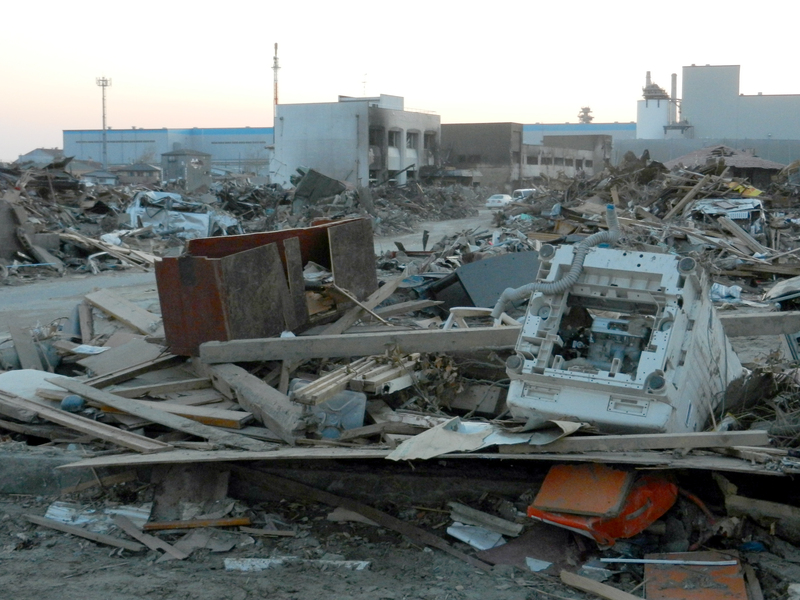 The tsunami strike is "beyond assumption" in many aspects: it reached almost every port town and city in Sanriku including the Ishinomaki city built-up area which in itself needs assistance in primary care (Photo 2). It is challenging to physically and institutionally rebuild the regional medical care system that is more robust in disastrous situations, and whether to realize hierarchy, concentration, and intensification geographically and/or institutionally will be once again a focus of debate. ※1 These issues started to have media coverage soon after the earthquake, and reports were compiled in a program including "NHK special: The Great East Japan Earthquake Disaster, how to sustain life, reports from the medical scene" (a translated title by the author), a Japanese TV program produced and televised by NHK (Japan Broadcasting Corporation) at 21:00-22:00 on 3 April, 2011. ※2 The following analysis and observation are based on S. Kyogoku 2009. Regional inequality in accessibility and convenience in the case of obstetrics, gynecology, and pediatrics services in Miyagi Prefecture, graduation thesis, Division of GeoEnvironmental Science, the Department of Earth Science, Tohoku University (in Japanese).